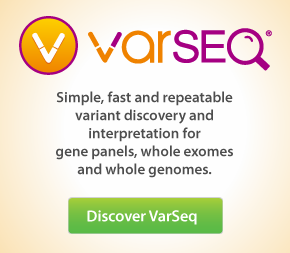 When you open the example project accompanying this tutorial, you will be greeted by the VarSeq Coverage Regions table. This table includes information about the read depth of each coverage region for the sample of interest. This will launch the CNV calling configuration window, which allows you to set the various parameters associated with the algorithm. Expected CNV Rate: The prior probability that a target is within a CNV event in the absence of evidence. A value of “Not Common” will result in fewer false positives but will increase the number of false negatives, while a value of “Common” will produce more false positives but will result in fewer false negatives. Minimum Number of Reference Samples: The minimum number of reference samples to be selected by the algorithm. Maximum Number of Reference Samples: The maximum number of reference samples to be selected by the algorithm. Exclude reference samples with percent difference greater than: This option will filter reference samples with a percent difference above the specified value after a minimum of 10 samples have been selected. Add samples to reference set: This option adds the current project’s sample to the set of reference samples. Independently normalize non-autosomal targets: If this option is selected, non-autosomal targets will not be normalized using the autosomal targets, but will instead be normalized separately. This option should be used if few non-autosomal targets are present, or if the entire X or Y chromosomes are likely to be deleted or duplicated. 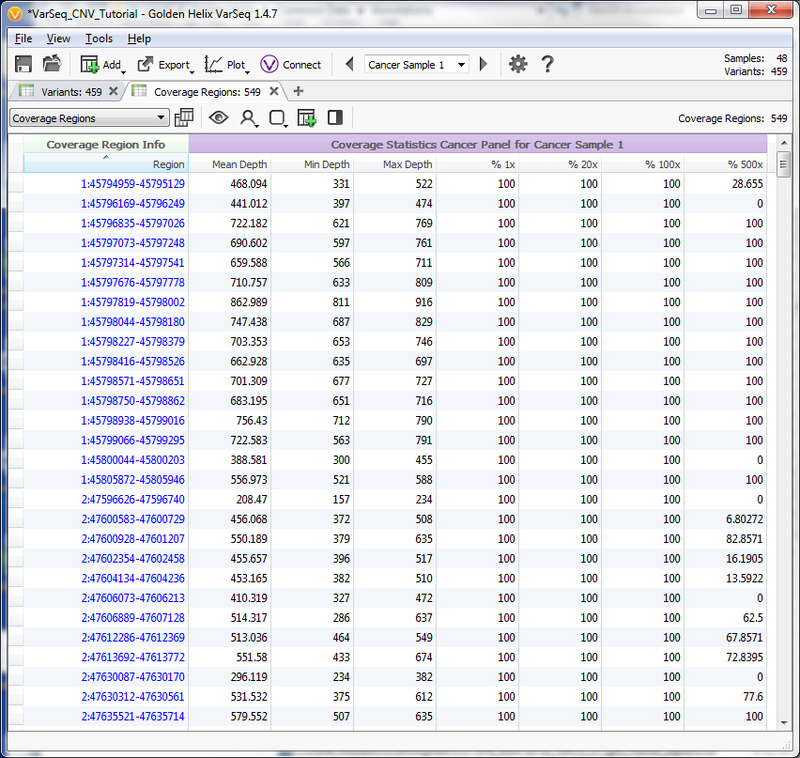 Controls average target mean depth below: Flags targets with average reference sample depth below the specified value. 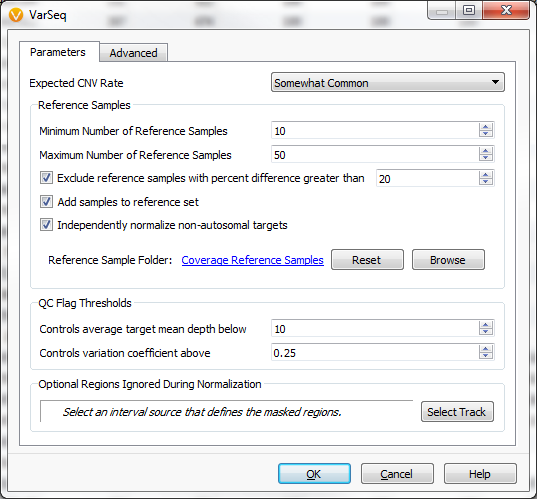 Controls variation coefficient above: Flags targets for which the variation coefficient is above the specified value. A high variation coefficient indicates that there is extreme variation in reference sample coverage for the target region. Optional Regions Ignored During Normalization: Here a region track ban be selected that provides coordinates for regions that will be excluded from the normalization process. When the algorithm runs, it will select a set of reference samples for each sample in the project. The reference set is chosen from the collection of samples in the reference folder that share the same target regions as the sample of interest. The algorithm selects those samples that are most similar to the sample of interest in terms of normalized coverage. Because we chose to Add samples to reference set, the 48 samples in our coverage table will first be placed in our reference set and then used by the algorithm.